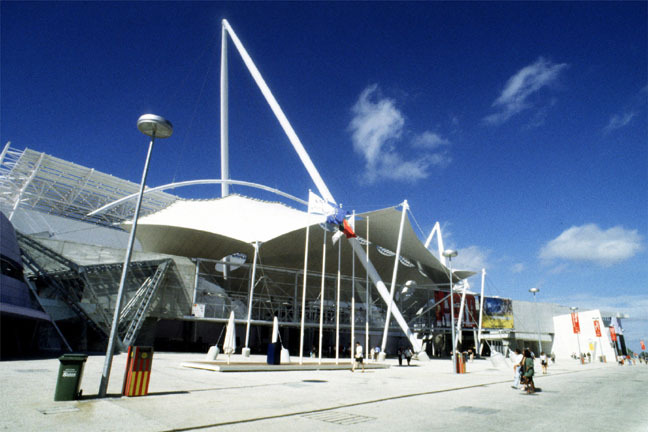 The 2017 International Ocean Colour Science meeting (IOCS -2017) will take place from 15 to 18 May 2017 at the Feira International Exhibition & Congress Centre in Lisbon, Portugal, to be followed by a Copernicus marine data stream training event on 19 May 2017. IOCS-2017 is being convened by the IOCCG in partnership with, and thanks to sponsorship from, EUMETSAT, ESA, the European Commission and NASA, and with the support of all the IOCCG-sponsoring agencies and organisations. The meeting is being organized with local support from the Instituto Português do Mar e da Atmosfera (IPMA). Please visit the IOCS-2017 meeting website regularly for the latest news and announcements. The overarching theme of IOCS-2017 is “Exploring New Capabilities for Global Ocean Colour Observations” with the overall aim of nurturing a strong global user community for ocean colour science and applications, and fostering exchange between the ocean colour research community and international space agencies. The IOCS-2017 meeting will include invited keynote speakers, presentations from space agencies, 12 breakout workshops, the NASA Ocean Colour Research Team (OCRT) meeting, a plenary on the European Commission’s Copernicus programme, and a large emphasis on poster presentations for participants to present their own research. A one day training event using data available from the Copernicus marine stream, focussing on the scientific basis of the products, will take place on 19 May 2017. Proposals for breakout workshops are now being accepted, and can be submitted via the meeting website. The aim of the breakout workshops is to develop a consensus of what the ocean colour community requires to carry out state-of-the-art research using ocean colour remote sensing. The breakout workshops will address current critical issues in ocean colour science and provide feedback to the space agencies, thus complementing the formal scientific program, and providing an opportunity for extended dialogue and exchange of ideas with international colleagues. The deadline for submitting breakout workshop proposals is 14 November 2016. In case you missed the NASA Earthdata Webinar “SeaDAS: Enabling the Study of our Planet from Space” by Daniel Knowles (15 June 2016), it is now available online from YouTube. See also NASA’s Earthdata parent webpage for other videos in the series. SeaDAS is free and publicly available software developed by NASA which enables users to process, visualize, and analyze remote-sensing data from standard desktop and laptop computers. The aim of this very informative webinar is to bring to scientists, students and the general public an awareness of SeaDAS as well as to increase awareness of NASA’s publicly available remote-sensing data. Some of the capabilities of SeaDAS are demonstrated during this webinar along with the types of studies and results one might expect to achieve. The emphasis is on the ease of use of SeaDAS along with its capabilities for more complex operations. Although this webinar is not intended as a detailed “how-to” tutorial, it will provide participants with an understanding of what can be accomplished using SeaDAS, and point them to the available help and support resources. Mobley et al. (2016) have published a technical report titled “Atmospheric Correction for Satellite Ocean Color Radiometry: A Tutorial and Documentation of the Algorithms Used by the NASA Ocean Biology Processing Group”. The intended audience is graduate students or others who are encountering this topic for the first time. Part I of the report discusses the generic atmospheric correction problem. Particular attention is paid to the definition, calculation, and interpretation of the so-called “exact normalized water-leaving radiance” and its equivalent reflectance. Other sections discuss direct and diffuse transmittances and vicarious calibration. Part II then describes, one by one, the particular algorithms currently used by the OBPG to effect the various steps of the atmospheric correction process, viz. 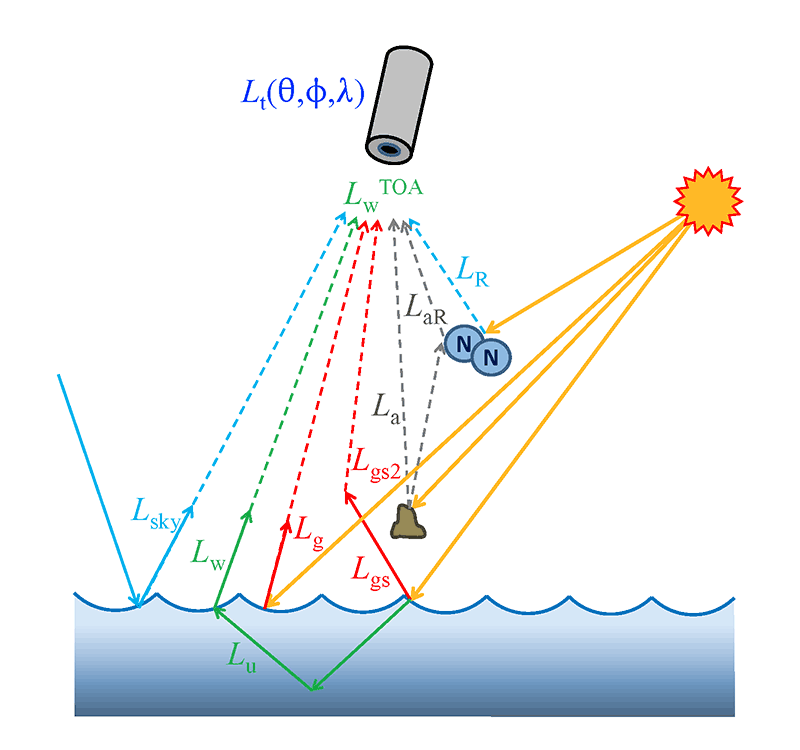 the corrections for absorption and scattering by gases and aerosols, Sun and sky reflectance by the sea surface and whitecaps, and finally corrections for sensor out-of-band response and polarization effects. The content of this tutorial is available online in the Atmospheric Correction chapter of the Ocean Optics Web Book, beginning here. A PDF version of the report can be downloaded as Mobley et al. (2016) in the references/publications section of the Ocean Optics Web Book. After five intense months of commissioning, the Sentinel-3A mission has been handed over to EUMETSAT for the day-to-day running of the satellite, although both ESA and EUMETSAT will manage the mission jointly. Essentially, ESA is responsible for the land data products and EUMETSAT for the marine products – all of which are made available for application through Copernicus services. ESA will also continue to monitor the satellite’s health. 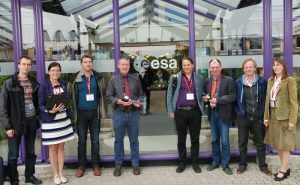 As part of the commissioning phase, ESA and EUMETSAT engaged with users, who provided feedback on sample data products. The intention is to release the first operationally qualified data products to all users in September. See news announcements from ESA and EUMETSAT for full details. Collaborators on Estonian research contract with ESA (click to link to ESA website). ESA recently awarded Estonia with its first contract since becoming an ESA Member State in 2015. Scientists from Estonia’s Tartu Observatory will lead an international team working on fiducial reference measurements for Sentinel ocean colour (FRM4SOC Project), focussing on measurement procedures and protocols, and SI-traceable laboratory inter-comparison experiments to ensure that measurements taken over the oceans by Sentinel-3’s ocean and land colour instrument (OLCI) are of the highest quality possible. Maintaining accurate and traceable ground-truth measurements is a major challenge for ocean-colour instruments, demanding detailed characterisation and extensive international collaboration. Tartu Observatory will collaborate with the leading European research centres National Physical Laboratory and Plymouth Marine Laboratory (UK), Royal Belgian Institute of Natural Sciences (Belgium) and the company ACRI-ST (France). The work will involve developing new measurement procedures and protocols, and traceable comparison experiments – both in the observatory’s laboratories and through work at sea. Satellite ocean colour radiometry (OCR) relies on vicarious adjustment and therefore on the long-term availability of precise and accurate in situ measurements to ensure the expected Earth observation products accuracy. ESA has launched a project called Fiducial Reference Measurements for Satellite Ocean Colour (FRM4SOC). Led by Tartu Observatory Estonia, FRM4SOC aims to establish and maintain SI traceability of Fiducial Reference Measurements for satellite OCR. As part of this project, a 3-day workshop is being convened at ESA/ESRIN, Frascati, Italy on 21-23 February 2017 to evaluate options for long-term future European satellite OCR vicarious adjustment infrastructure for the Sentinel-3 OLCI and Sentinel-2 MSI A/B/C and D instruments. MERIS users are informed that the full mission Envisat MERIS Reduced Resolution (RR) datasets have been migrated to the ESA EO centralised dissemination service with online access through a new release of MERCI integrated in the EO Single Sign-On (EO-SSO) architecture. Access to this data has been changed accordingly and the MERIS RR Level 1 and Level 2 datasets are now available upon EO-SSO authentication via the new version of the MERIS Catalogue and Inventory – MERCI v2.3.2. New users can obtain access to Envisat MERIS RR data via Fast Registration. ESA EO users already having a Fast Registration for free access to MERIS RR data can retrieve the new access information via the “My Online data” area on the My Earthnet pagesusing their personal EO-SSO account. The same EO-SSO ID is applicable for MERCI. Note that access to the current MERIS RR MERCI http and ftp servers at the UK-PAC is being phased out and will be disabled on 30 June 2016. Please contact EOHelp if any further clarification or assistance is required to access the MERIS RR data via the new service. Drs. 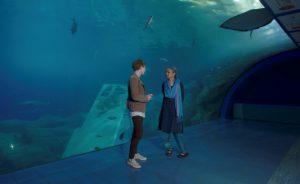 Hayley Evers-King and Shubha Sathyendranath discuss ocean colour research for the “Oceans From Space” MOOC. This autumn, EUMETSAT will run its first ever Massive Open Online Course (MOOC) on the theme of monitoring the oceans from space. The Oceans from Space MOOC is aimed at a general audience and will give an introduction to the benefits and potential uses of satellite-based ocean observations collected in the framework of the EU Copernicus Programme. It will explain how to access and use marine Earth observation data and information from Copernicus/EUMETSAT missions and also the Copernicus Marine Environment Monitoring Service. Ocean colour will feature prominently in the MOOC. Funded by the EU Copernicus Programme, the course will be run entirely online over five weeks with three hours of study a week involving an interactive mix of videos, written information and exercises. The course will be open for registrations on the FutureLearn website in early-August and will start officially on 24 October 2016. The MOOC is being developed by Imperative Space in partnership with Plymouth Marine Laboratory, the National Oceanography Centre (Southampton), Collecte Localisation Satellites (France) and NASA Jet Propulsion Laboratory. For more information, please contact neil.fletcher@eumetsat.int. Several new publications have been added to the IOCCG Recent References list including a paper by Soppa et al. (2016). They examined the mean patterns and interannual variability of diatom bloom phenology in the Southern Ocean, using 15 years of satellite-derived diatom concentration from September to April (1997–2012), based on the Southern Ocean diatom chl-a product developed by Soppa et al. (2014). Mean spatial patterns of timing and duration of diatom blooms are generally associated with the position of the Southern Antarctic Circumpolar Current Front and of the maximum sea ice extent. In several areas the anomalies of phenological indices were found to be correlated with the El Niño-Southern Oscillation (ENSO) and Southern Annular Mode (SAM). 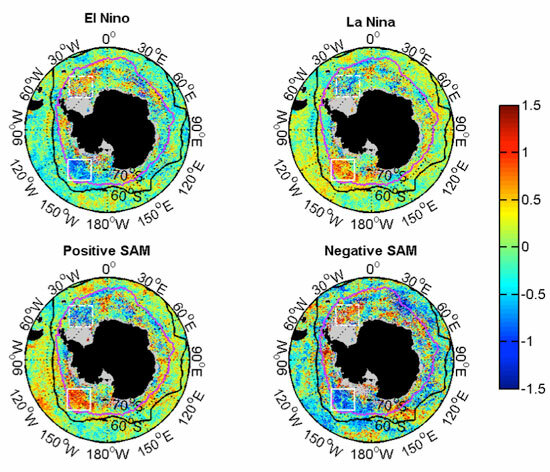 Composite maps of the anomalies reveal distinct spatial patterns and opposite events of ENSO and SAM have similar effects on the diatom phenology. For example, in the Ross Sea region, a later start of the bloom and lower diatom biomass were observed associated with El Niño and negative SAM events; likely influenced by an increase in sea ice concentration during these events. Composites of bloom start date standardized anomalies during El Niño (N = 6), La Niña (N = 8), positive SAM (N = 7) and negative SAM (N = 4) years. Black lines show the mean position of the Polar Front over 1997–2012. Purple line displays the median position of the maximum sea ice extent over 1997–2012. The white boxes depict the Weddell Sea region (dashed) and the sector between 120°W and 180°W (click to enlarge). In another new publication, Neukermans et al. (2016) developed an optical classification of marine particle assemblages based on hyperspectral measurements of the particle backscattering-to-absorption ratio. The authors show that the resulting optically-derived particle assemblages (OPAs) were associated with specific ecological conditions in the western Arctic Ocean. Differentiation among OPAs improved performance of predictive bio-optical relationships and provides an extension to the Phytoplankton Functional Type concept by accounting for the coexistence of algal and non-algal material in natural waters. They also demonstrate the advantage of hyperspectral optical measurements compared to multi-spectral measurements for discriminating particle assemblages. (left) Dendrogram obtained from hierarchical cluster analysis of 216 normalized spectra of bbp(λ)/ap(λ). (right) Mean spectrum of normalized bbp(λ)/ap(λ) for each of the seven clusters. (click to enlarge). Moses et al. (2016) recently investigated the spatial scales of optical variability in the coastal ocean. One of the important sensor design considerations in coastal remote sensing is the minimum spatial resolution required to resolve optically discernible coastal features that are of biogeophysical importance. The authors investigated the spatial scales of variability in optical properties of coastal waters using continuous, along-track measurements collected using instruments deployed from ships, aircraft, and satellites. The sub-pixel variability for a given Ground Sampling Distance (GSD) was defined as the average coefficient of variation, CVa, within a pixel. The relationship between CVa and GSD was investigated for a number of bio-optical variables. Points of distinct transition in the relationship between CVa and GSD were evident between 75 m and 600 m, varying depending on the location and the optical parameter, and representing the GSD above which most of the spatial variability due to small-scale features was subsumed within a pixel. On average, the transition GSD was around 200 m, suggesting that a spatial resolution much lower finer than 200 m is required to resolve small-scale coastal features. There was generally minimal spatial information change in the GSD range 500 – 1000 m, suggesting that a sensor providing daily global coverage at 1-km spatial resolution would yield spatial information similar to that from a spectrally equivalent sensor with 500 m spatial resolution. The average coefficient of variation, CVa, of the particulate absorption coefficient at 450 nm at various Ground Sampling Distances GSD for in situ data collected in Long Island Sound in 2005 plotted on (a) a linear scale and, (b) a log-log scale, illustrating differences in the relationship between CVa and GSD on either side of the transition point, GSDt. (click to enlarge). 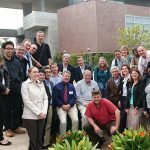 Several new employment positions have been posted on the IOCCG website including an ocean colour EO position at Brockmann Consult (Germany), a postdoctoral position at University of Nantes (France), a Satellite Oceanographer position at Silver Spring, MA (USA), and a Masters student opportunity in Rimouski, Canada. For further details on these, and other employment opportunities, see our Employment Opportunities.